We’ve been known to undertake a challenge or two here at Hampshire Flag; the MD’s trekked to Everest Base Camp and our Print Room Manager’s cycled from Land’s End to John o’ Groats. 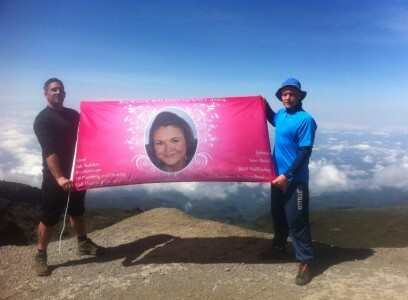 But when Michael Parker got in touch and said that he and his friend Kenny Parkes were climbing Mount Kilimanjaro in memory of their friend Nadine Blake, who died from cystic fybrosis when she was 18, we doffed our caps and happily fulfilled their request for a bespoke flag to take on the climb. Their aim was to raise £10,000 for Southampton General Hospital’s cystic fybrosis unit but, incredibly, the current total stands at more than £13,000 – what an achievement! Michael and Kenny successfully scaled Africa’s highest mountain and when they reached the top, they unfurled the pink flag and flew it in Nadine’s memory. The money they’ve raised will be used to build a garden for the patients on the cystic fibrosis unit and for equipment. Well done lads – we hope you’re putting your feet up now!